The interview has been done by Olaf Koens @OBK. MH17 eye-witness: "my goal is justice". 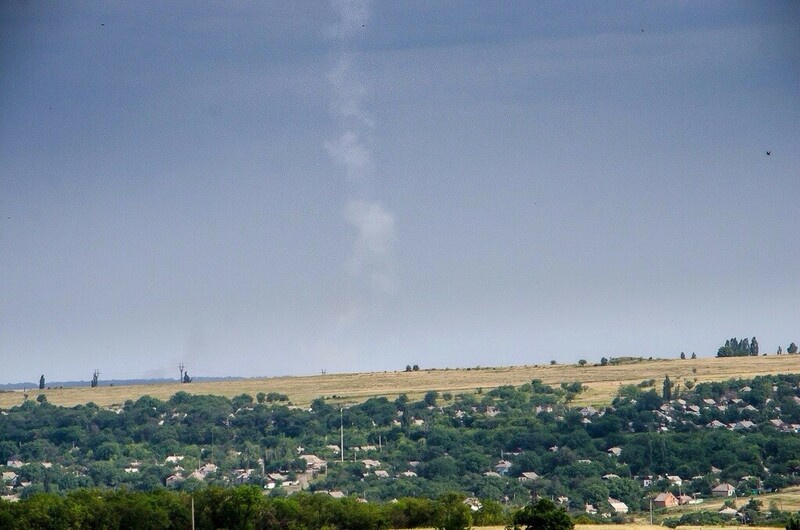 An inhabitant of East-ukraine heard a big bang, when MH17 was shot down. Shortly after he took some photos that indicated the airplane was shot down from Russian-rebel-held area. Journalist Olaf Koens talked with him. Can you explain what you experienced on July 17th? "That day did not foretell anything special would happen. In the morning I woke up and went to my work. At four ó clock in the afternoon I arrived home. And at 16:20 we heard an explosion. The first explosion was not very heavy. 15 seconds later, something like that, there was a second explosion, which was louder and it made the windows shake." What did you do when you heard the explosion? "Explosions were no exception anymore. But this was totally different, that explosion. It did not sound like anything we heard before. I immediately wanted to look where the sound came from. What had exploded? Where? What? How? I ran to the covered balcony. I looked around en saw nothing. I photographed that white trail in the air. At that moment I did not know what it meant. For me it was just a white trail: from the horizon up into the clouds where it diverged. Only after a while it became clear what it was." How much time was there between the explosion and the photo? "That was a minute after the explosions, I think. Maybe even less, something like 30 seconds." "I was the only one on the balcony. But the other inhabitants all were also on their balconies. Behind every window you could see a face." There are more people who saw the trail at that moment? There are more people who photographed the same? "That is very well possible. But at that time, July 17th, there were already rumours in the city that making photos was not really safe. It was being said: don't make photos if you don't want to end up in 'uncomfortable situations'. At that moment the city was already occupied. At the administration building there was a flag and it was not a Ukrainian." Do you still have the camera with which you took the photos? "I contacted a friend of mine and gave him the photos, including the originals. That friend contacted the SBU and they were interested in the photos. He handed them over to the SBU. After that I had to explain the details of the photo to them and hand the camera over to them." Did they compensate you for this? "To replace it? Of course. They paid the value of the camera back to me." Did you make private copies? "Sure. But I had to give them the flash-cards too." And after that you went to Kiev? "Yes, in the beginning I directly spoke to with the SBU. After that representatives of the international investigation committee contacted me via the SBU. That was beginning of August, when I also handed them the camera. THe SBU didn't need it themselves and gave it to the Dutch researches. They had asked for the camera." Did the researchers talk to you? "Yes, I talked extensively with the researchers of the international committee. Those were two researchers: one from the Netherlands and one from Australia. We talked about three hours and it was recorded with a video camera." Do you think they can use your material? "Yes I think they will use it. The photos are circumstantial evidence. There are no other photos available that proof that this BUK launched something in that area. While everybody knows what the truth is, there is no other evidence." Why did you agree to have this interview? "I want justice. I want that the people who did this will be judged. Are you hopeful about that? "I think the truth will prevail whatever happens." Also The Dutch NOS has published a very short video with an additional photo that had been taken at th same time and a short interview with the photographer (in Russian with Dutch subtitles). You can find the original article in Dutch video here. Also it is clear from this photo that ABOVE in the sky clouds can already be seen. At the crash site 20 kms further North it was cloudy at that time. This second photo shows enough similarity with the first one, that there does not have to be any doubt about its authenticity. A copy of the original 2nd photo can be downloaded here. This interview with the photographer, his witness report and the fact that a SECOND photo was taken so shortly after the incident should remove all doubt that these photos are authentic. They show a surface to air missile trail. We know a BUK was in that area, the only thing that could have shot down MH17. So: a BUK missile was fired from (Russian) occupied territory that shot down MH17. Also see how I determined the launch location based on the first photo. ALL relevant blogs about MH17 can be found here.